If you’ve spent any time reading up on content marketing, you’ve likely heard the saying “content is king.” Done right, content can be a huge source of growth for any company. Although the content itself is extremely important, it pales in comparison to the promotion of it. You can write the most epic blog post in the world. But if no one reads it, what good is it? So before you write your next blog post, make sure that you have a solid content promotion strategy in place. In this post, I’ll walk you through the 4 pillars of our content promotion strategy and break down all the specific tactics within each one. While new social media platforms emerge, and algorithms continue to change, email has remained virtually unchanged since the early 90s. More importantly, it’s still the primary form of communication for businesses. We’re also placing a high priority on building our email list for two main reasons. It’s an asset that grows over time. And while organic reach on Facebook and Twitter can be lower than 5%, open rates for email marketing messages are generally in the 20-30% range. While we’re certainly not ignoring social media (in fact we’ll discuss it in the next section), email does have its benefits. Here’s our easy to follow process for building and leveraging your list. First things first, you’ll want to install a tool or plugin that will enable you to capture email addresses. KISSMetrics provides a great list of tools in this post. Every tool has its own advantages and disadvantages so you’ll need to figure out what’s best for you. On this blog, we’re using the Thrive Leads plugin because it gives us the flexibility to capture emails and create content upgrades all within one platform. 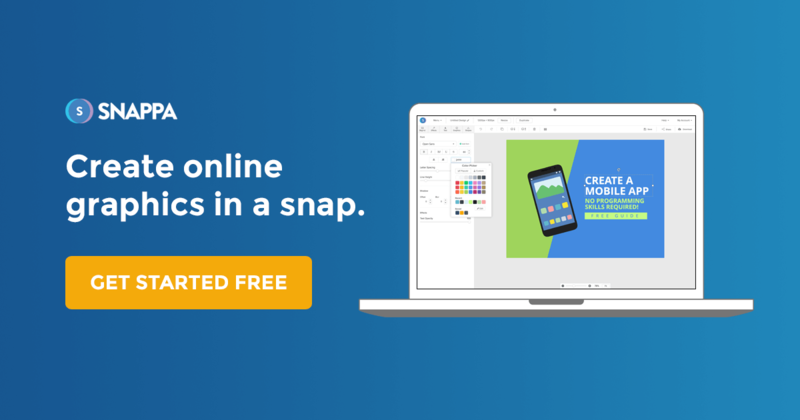 The last thing you want to do is leave a very generic message saying “Sign up for our free newsletter.” To boost your opt-in rate, you’ll want to create a lead magnet. A lead magnet is simply a free bonus or incentive for people to subscribe to your blog. This can be an ebook, a PDF, a white paper, anything really. The important thing is that it’s valuable and highly aligned with the interests of your target audience. 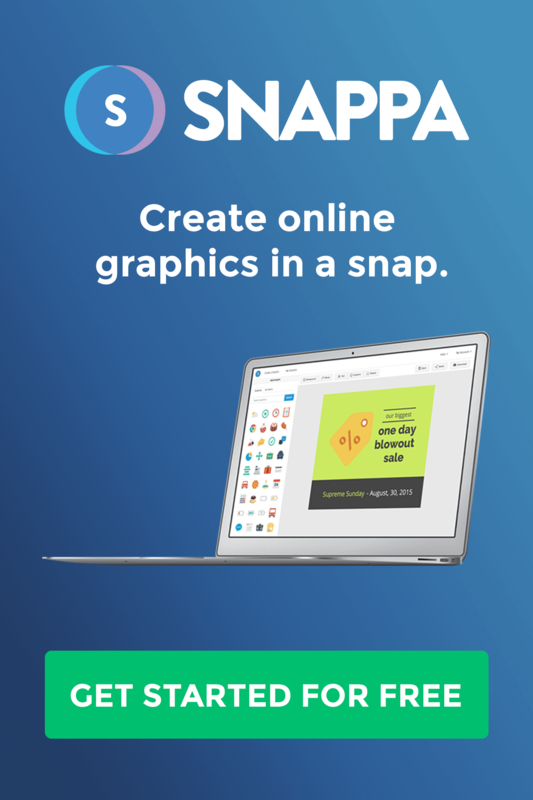 With Snappa, our target market is digital marketers and small business owners. Thus, we put together an ebook with 16 highly effective strategies for generating traffic and boosting conversions. You can find it on the right sidebar. Before creating this lead magnet, we were converting about 1% of readers into subscribers. Now, we’ve boosted our conversion rate to 4.15%. That’s a 315% increase overnight! The content upgrade is the evolution of the lead magnet. Rather than a free bonus that is offered across your site, a content upgrade is a specific bonus related to a post. For example, let’s say you’re writing a list post with 10 different ways to grow your social media following. A content upgrade could be a PDF checklist or 5 bonus tips not included in the post. Content upgrades work so well because the offer is directly targeted to the post they’re reading. So if the post is good, they’re highly likely to be interested in the upgrade. In our post about how to come up with blog post ideas, we offered a cheat sheet as a content upgrade. This converted at a whopping 15.6%! Other influential marketers have also had plenty of success using this technique. Look no further than Brian Dean who increased his conversion rates by 785% using this technique. With your list building tool and your lead magnet in place, you’ve got some emails coming in. Now it’s time to enjoy the fruits of your labor. Whenever you publish a new post, simply notify your list. Depending on how frequently you’re posting, you may want to dial back to a weekly digest or enable your readers to select from a variety of frequencies. While some people might look forward to a daily email, others might get annoyed and unsubscribe. While email provides higher engagement than social media, we certainly don’t ignore it – and neither should you. In fact, social sharing has one huge benefit that email doesn’t… virality. Unfortunately, simply posting your link to Twitter will not make your post go viral. But… there are things you can do to maximize your potential reach. There are so many social media platforms out there that if we tried to be active on all of them, we’d fail miserably. The last thing you want to do is spread yourself too thin. The reality is, there’s going to be 1-3 platforms that give you the most bang for your buck. In our case, we’re focussing heavily on Twitter, while also looking into Facebook and Linkedin. It’s much more effective (and profitable) to spend all your energy on 2-3 high converting platforms, rather than wasting your time trying to maintain 10 different accounts. If you’re trying to figure out which platform is right for you, Kevan Lee from Buffer wrote a helpful post on how to choose the right social network for you business. People are inherently lazy. So if you want your readers to take a certain action, make it incredibly easy for them to do so. Whenever we send out our posts to our email list, we include a line in our PS that encourages them to share the post. All they have to do is click the link and the rest is taken care of. Another way to leverage this technique is to add click to tweets within the blog posts themselves. If you have an interesting stat or quote, you can highlight and hyperlink it so users can tweet it out to their following. Since your tweets are only seen by less than 5% of your followers, it’s absolutely critical that you share the same article more than once. When our article is ready to go, we schedule multiple tweets in Buffer to maximize the chances of our followers seeing it. But what you don’t want to do is send out the exact same tweet. To switch things up, we create multiple snippets linking to the same article. That way, the same tweet isn’t showing up over and over again in people’s Twitter feed. Also, tweeting out quotes and stats can sometimes create more engagement than sharing a headline. When most people think about content marketing, they think about blogging. But blogging is just 1 piece of the content puzzle. For every blog post that you write, there’s an opportunity to repurpose that content into a variety of different formats. This can include Slideshares, YouTube videos, infographics, and the list goes on. 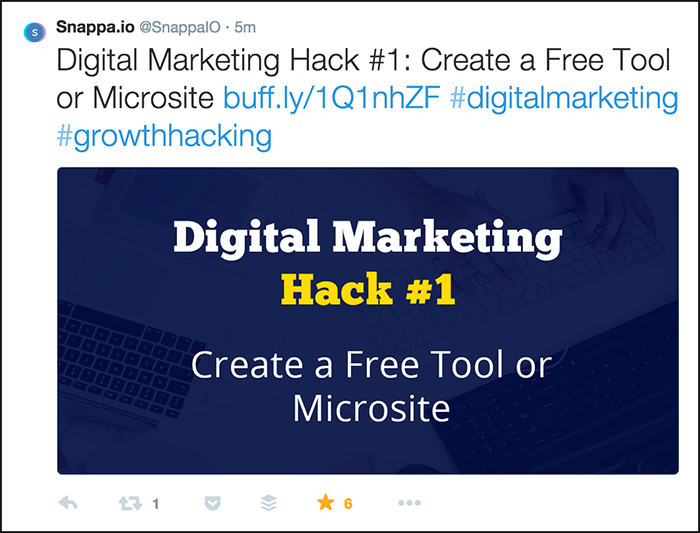 When we created another eBook called the Digital Marketing Hackbook, we didn’t just stop there. We also turned the contents of the eBook into a slide deck that we uploaded to SlideShare. That slide deck has generated over 1,000 views in less than a week and we have no audience built-up on SlideShare yet. Wouldn’t it be awesome if you developed a product or service and all of your potential customers were hanging out in one spot? That’s the beauty of communities. Regardless of how connected we are on social media, nothing can replace the camaraderie and relevancy that a niche community provides. And as a marketer, it’s your job to become a contributing member of the communities that are most relevant to you. If you don’t know where to start, begin by browsing large, multi-topic communities like Reddit. From there, you’ll also want to find smaller, singular focused communities like Inbound.org, GrowthHackers, Hacker News and Product Hunt. Once you find the communities that are relevant to you, it’s time to leverage them in the proper way. The absolute worst thing you can do is join a community simply to promote your products and services. Not only will you risk getting banned, but you’ll also turn off your potential customers. Instead, focus on providing value without expecting anything in return. Doing so will allow you to connect with the members of the community on a much more personal level. Eventually, people will become familiar with what you do. In a recent thread on Inbound.org about time saving tips, I wrote a helpful comment that was up-voted to the top of the thread. I didn’t mention anything about our startup and what I was working on. Yet several members engaged with me and ended up checking out Snappa. Not all communities are setup this way, but most of the popular communities allow you to share articles. While it might be tempting to just share your own, you’re doing yourself a disservice. Not only will other people get annoyed of your constant self-promotion, but you can generally build up “karma” by sharing other people’s content and receiving up-votes. For every article of your own that you share, try sharing at least 3 other articles. The whole point of joining a community is to interact and engage with the other members. If you’re simply there to post articles, you’re missing out. Not only do you want to reply to threads and provide value, you also want to take it a step further by following other members and maybe even reaching out to them personally. The more followers you have in a community, the easier it is to get traction when you do in fact share your posts or write insightful comments. Last but certainly not least, no content promotion strategy is complete without good old fashion email outreach. Whenever you write a post, here are the four types of people you should consider reaching out to. One of the most important things about blogging is getting people to share your content. Coincidentally, this is also one of the most challenging aspects of it. But one of the easiest ways to increase your chances of getting social shares is to mention influencers in your blog post, then let them know about it. This strategy works so well because mentioning people in your blog posts makes them look good. For that reason, almost all of them will be happy to share your content. 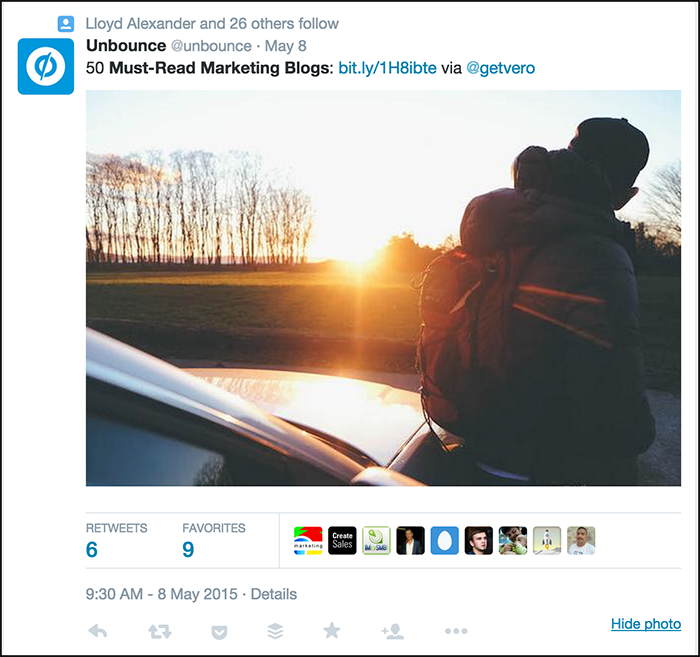 Take a recent post by Jimmy Daly from Vero titled 50 Must-Read Marketing Blogs. If you take a closer look on Twitter, you’ll notice that most of the ballers mentioned in the post ended up tweeting out the link. The chances of you writing about a completely new topic are pretty slim. So using a tool like BuzzSumo, find other articles that are similar to yours. Then, reach out to the people who linked to them and let them know about your post. Another effective way of doing this is to leverage the articles/sources you’ve mentioned in your post. For example, if you cited another article or cases study in your post, use a tool like Open Site Explorer or AHREFs to see who linked out to that post. Then, you can reach out to that person and let them know about your article. Since they linked out to an article you cited, they might be interested in your post as well. It’s pretty easy to figure out who shared your articles in the past. Just search for your previous posts on Twitter. From there, you can send them a direct tweet and let them know about your new post. Obviously, you don’t want to harass the same person every time you publish a new post. So do this sparingly. Finally, every topic has a variety of key influencers. To find them, you can use a tool like Followerwonk. But before you think about emailing them, focus on building a relationship first. Notice that personal email was the last thing on the list. Once you’ve put together your list of influencers and you’ve made a concerted effort to engage and provide value, then you can reach out to them and let them know about your post. Only let them know about killer content. These people are influencers so they need to be wowed or else they won’t share. Don’t email them too often. Make sure you have a big enough list of influences so you can email different people for each post. 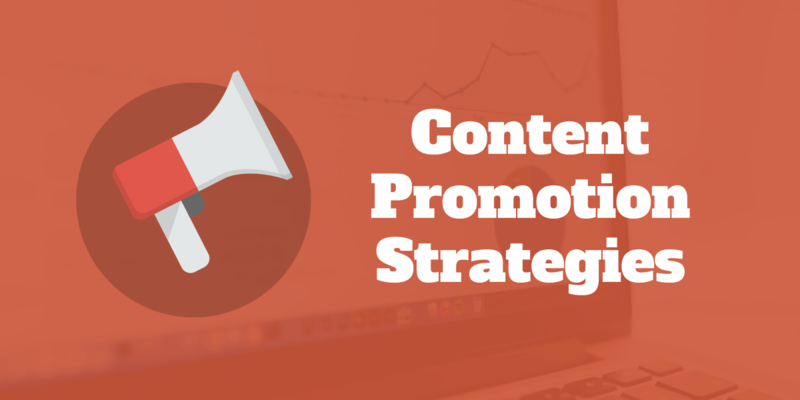 By sharing the 4 pillars of our content promotion strategy, I hope that I’ve given you some great ideas on how you can promote your content more effectively. Just remember that creating content is only one part of the content marketing equation. If you’re not actively promoting your content and getting it in the hands of your target audience, it won’t matter how great it is. If you have some other promotion strategies not mentioned in this post, I’d love to hear about them in the comments below.